LEGO IDEAS - Build something spectacular from the world of 007! 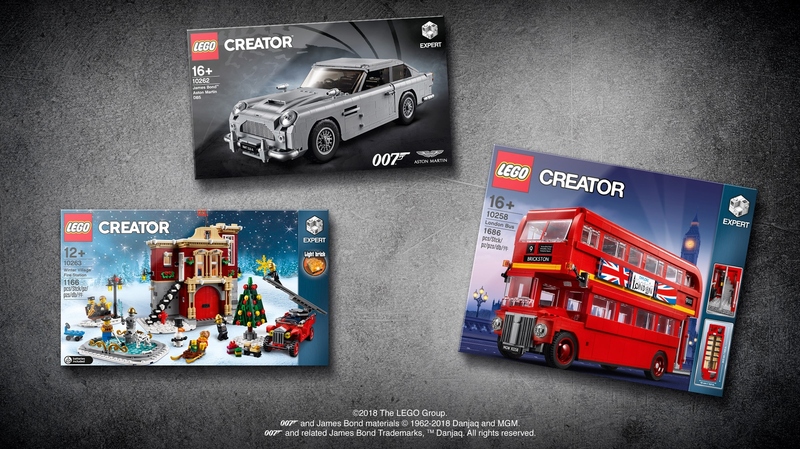 Build something spectacular from the world of 007! The winners have been chosen! Thank you for participating in this creative contest. We've been blown away by all the spectacular entries! This contest is now closed. Thank you for participating. “What would James Bond do?”. Ask yourself that as you tackle our 007 Building Challenge where we invite you to Build Something Spectacular from the world of 007! What we’re looking for is a creative build that really embodies the spirit of the James Bond universe. It could be your favourite iconic movie scene, landmark or vehicle, an emblem or motif, or a gadget-filled tribute to Q – the ultimate creative genius. Whatever it is, it should be unmistakeably Bond… in LEGO bricks! 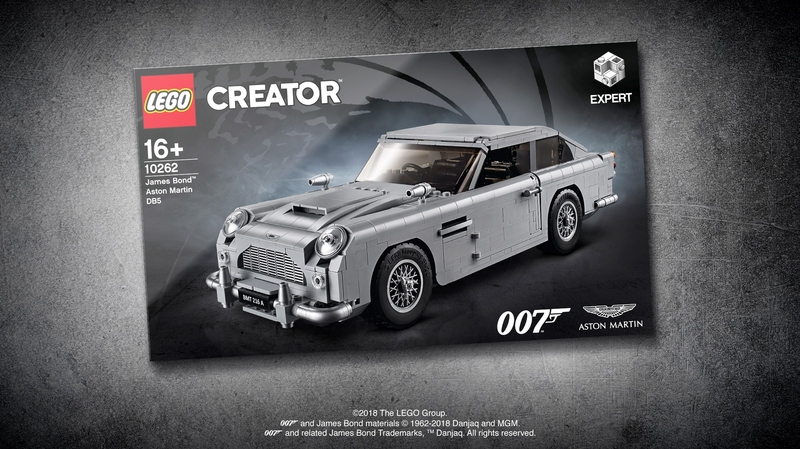 The Grand Prize winner will receive no less than the 10262 James Bond™ Aston Martin DB5 accompanied by a poster with an outline of the car signed by the LEGO Designer. 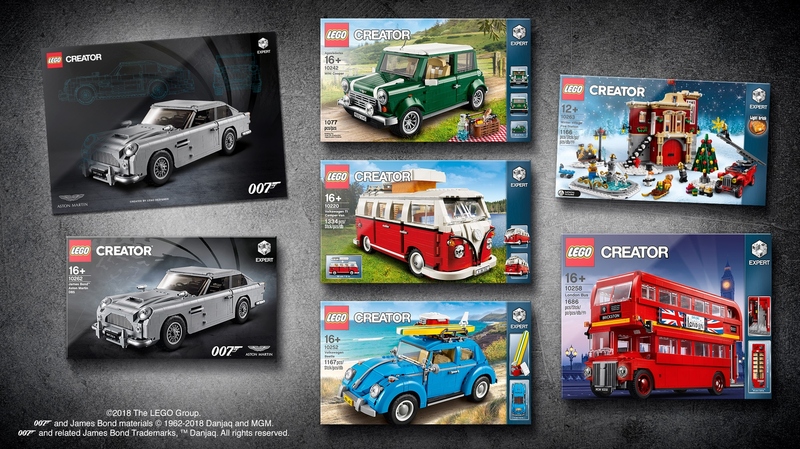 On top of that, the Grand Prize winner will get the full vehicle package from LEGO Creator Expert consisting of 10220 Camper Van, 10242 MINI Cooper, 10252 VW Beetle and 10258 London Bus, and just because we are feeling the Christmas spirit, we want to top it off with the 10263 Winter Village Fire Station. ENTRY DEADLINE: Submit your entry no later than November 27th, 2018 at 6:00 a.m. EST. If you’re not sure what time zone you’re in, here’s a  time zone converter. Submission Phase - Build and submit your entry before November 27th, 2018 at 6:00 a.m. EST. We recommend submitting your entry 2-3 days before the deadline in the event we have to return it to you for changes. Judging Phase – Our judges review the entries and choose the winners by December 12th, 2018. Winners Announcement  – We will share the Grand Prize winner, two Runner Up winners and a Bonus winner here on LEGO Ideas no later than December 21st, 2018! Submissions may be in either physical bricks or by using a digital building tool such as LEGO Digital Designer. You’re welcome to use image editing tools, such as Photoshop, to enhance your photos/presentation. Take up to five photos of your creation and submit them to the contest. Make sure to show off your model from all angles and any particular features or functions of your creation. Add a title and a short description. Upload your entry to the contest using the blue Submit Your Entry button on this page. Content Entries may contain LEGO System elements or LEGO Technic elements (no LEGO DUPLO elements). These LEGO elements must be genuine (not cut, glued, drawn on or otherwise modified). Entries should relate to the James Bond universe and not consist of or contain copies of any other existing third-party work or creation or infringements of any third party intellectual property right. This means all entries containing third party IPs, such as printed parts or Minifigures accessories from Marvel and DC Comics™ Super Heroes, Star Wars™, Lord of the Rings, etc. will not be eligible for the contest – this also includes The LEGO Movie. Update 17/10/2018: Vehicles and buildings found in the James Bond universe are exempted from the rule preventing submissions based on third party IPs. Therefore, it's acceptable to submit an entry based on, for instance, BMW, Lotus, etc. Please do not use any logos in your submissions. No custom artwork (stickers/prints). Entries may only contain official LEGO-made stickers or printed elements from non-licensed sets. You must be the original creator of all creative work you submit (the model, images, photographs, description text, etc.) and you must have the exclusive right to submit your model to this LEGO Ideas Contest. You may not submit a model made by, or on behalf of, someone else. Entries must be new creations and not previously posted online or submitted to any other contest. You may submit digital entries using  LEGO Digital Designer, which is available for download via  this link  free of charge. Any entries made in LEGO Digital Designer should not show the baseplate from build mode. You may also create digital entries using third-party LEGO CAD software. You may use photo editing software and add visual effects to photos of your entry. If you use visual effects of any kind, please do ensure that your model is still clearly visible. Entries containing photos that are too dark or blurry will be removed from the contest. To ensure easy judging of your entry, we recommend taking several pictures on a neutral background free from background clutter, with your model well framed and shown from different angles. Please do not include people or limbs in photos you submit. Photos containing such will be removed. Entries containing defamatory or degrading elements will not be eligible for the contest. Any cheating or harassment of other participants will result in disqualification from the contest. Your contest entries and comments on contest entries  must follow the complete LEGO Ideas House Rules. The Bonus winner will be drawn 100% randomly. You must be at least 13 years old to participate and enter. You may submit multiple entries to the contest, but only one entry per person will be considered when winners are selected. This means you cannot win as a Runner Up and as the Grand Prize winner with two different entries. Winners will be contacted on the email address associated with their LEGO Ideas account after December 12th, 2018. Winners will be announced on LEGO Ideas when all winners have returned the signed Winner’s Certification Documents. A winner who does not return their Winner’s Certification Document within one week (5 days) of receiving it will be disqualified, and a new winner will be selected. Thia contest is not open to residents of Iran, North Korea, Myanmar/Burma, Zimbabwe, Sudan, Syria, any other U.S. sanctioned country and where prohibited or restricted by law. By entering the contest, you agree to follow the rules on this Contest Brief page and you agree to the LEGO Ideas  Terms of Service. This Competition is offered, organised and run solely by the LEGO Group and not by Aston Martin Lagonda or any of its group companies (Aston Martin). Participants should direct all queries and matters relating to the Competition to LEGO Ideas. Aston Martin shall not be responsible for any failure by the LEGO Group to run the Competition or to provide the Prizes. For more information, see the Contests Beta FAQ.